Planning a party or attending as a guest? Upper Canada Soap Aroma Cocktails are perfectly festive for decoration or a hostess gift! These are so cool! They are cocktail inspired waterbead diffusers that combine the trend of exotic cocktails and home decor, providing fragrance in a fun package! 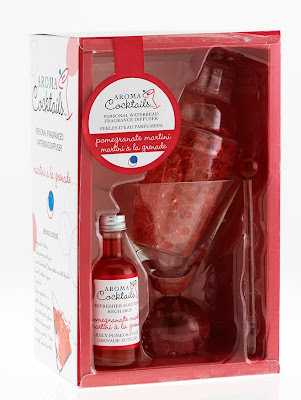 Each package contains a cocktail shaker filled with waterbeads, one bottle of fragrant solution, one stir stick and a cocktail glass for display and use. Simply fill the cocktail glass with waterbeads and the fragrant solution of your choice and stir. Available at www.uppercanadasoap.com for $30.00.